I love David Foster Wallace, but he’s a strange one. He’s been described as a human eyeball, which is also a good way to describe how he makes a reader view the world. Everything is laid bare, all small details magnified, even the parts of human life we’d normally avoid or ignore. 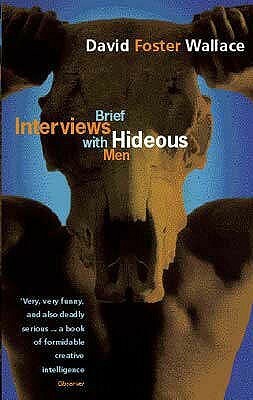 Brief Interviews with Hideous Men is an uncomfortable but insightful book of short stories. Examining self-consciousness, loneliness, misogyny, and other more lurid aspects of modern life, the narratives flash between ridiculous, heartfelt, skull-achingly painful, and very occasionally beautiful. I get the feeling that very few people could read this and find it mediocre. The reactions would be love it or hate it. I’m in the former camp, but even so some stories just left me bewildered or mentally exhausted (for example, “Tri-Stan”), unsure whether the effort to get through these was even worth it. And then pieces of genius like “Forever Overhead”, “Adult World (I)” and “Brief Interview #20” remind me why I think David Foster Wallace was one of the greatest writers of the 21st century.